As the name suggests, this form of Goddess Durga possesses as dark a complexion as a dark night. Her hair is entangled and she displays a very fearful appearance. Her hair is always kept open which keeps waving with the breeze, she has huge red eyes and her red tongue juts out making her posture all the more ferocious. When she breathes, her nostrils emit dreadful flames. She sits on a donkey and has four hands and three eyes which shine bright with intensity and anger. She holds a cleaver in her upper left arm and a torch/dragger in the lower left hand. The right hand on the upper part is positioned in the Var Mudra, blessing the devotees while the lower right hand is in Abhay Mudra thereby protecting her worshippers. The seventh night of the Navratri puja is considered very auspicious and significant because during this night special puja is performed to awaken powers and attain siddhi. 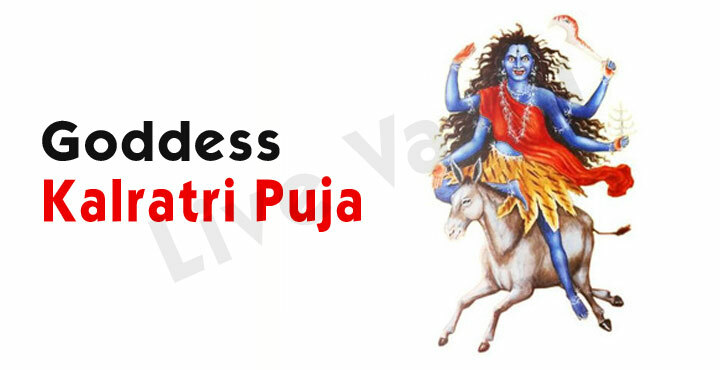 It is believed that chanting of Goddess Kalratri’s mantra keeps all evil spirits and ghosts away from you. The ‘Raktabeej Daman’ chapter from ‘Durga Saptashati path’ should be recited on this day along with the following other mantras and shlokas.